Optima batteries - Read before buying! Optima AGM Batteries – It makes use of the most advanced technology based on SPIRALCELL design. It performs better than most of the lead acid batteries because of its strong and clean power source. They are durable and trustworthy. Go for this if your vehicle requires a lot of power because of their ability of fast recovery and meeting peaks. This is possible due to quick cycling and top cranking power. Make arrangements to get this battery if you have trucks with winches, commercial vehicles and extreme stereo systems among others. Choose these reliable batteries for your electrical needs. Why? Apart from having more power output, they have low internal resistance. Do you want a battery for high cold cranking amp? This is the best for you. Its design allows it to deliver a high ignition power charge of 5 seconds to start up. Avoid common battery failures by choosing this battery. Basically it is meant for vehicles with demand starting characteristics such as trucks, street rods, SUV’s, off road vehicles. They have characteristics that may not be found in other batteries: durability, faster speed of recharging and even ability 3 times higher charges compared to the traditional batteries. 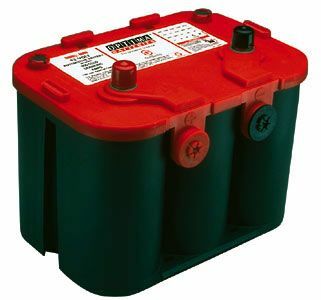 If you have boats and RV’s, this is the battery. Optima BlueTop is also suitable for applications that drain other batteries. Like other Optima, no need of maintenance. I no longer have problems during the coldest days of the year. It has more power for starting up than I expected. Whether it’s new or old, the performance is the same. I wish it continues this way, I tell you it would be the best battery for me so far. As much as this battery is more expensive than some like the “el cheapo” brands, it is worth spending money on them. They will provide the best service possible. My car is rarely driven and I used two Optima RedTop batteries for the last few years, both of them chocked up and my conclusion was that the Optima batteries are of low quality. You can use the same amount of money to buy Odyssey battery that is more reliable and has warranty. It is so sad that when the battery is dead that is the end. Even if you recharge it, believe me you will be wasting your time. My truck is never used every day so I wanted to get a battery that would hold charge for quite some times. This was after 5 years. So far I don’t have any problem with what I purchased because it doesn’t fail in cold weather compared to summer and also has an electric snow plow lift. You cannot find this with normal batteries. My battery was delivered faster and at the right time with everything as it was in the advertisement. My car is 18 years old. Would you believe if I tell you that this battery starts this car of mine even if the weather is at -40 or -55 F. Starting my car is not a problem even if the transmission is too cold to initiate a movement? I’m not regretting having spent my money on this battery. It is worth it. Read Optima batteries reviews before buying buing new or used Optima car battery!